A: The tour lasts about one hour. Plan to arrive 15 minutes early and enjoy a campfire on the lawn between the Jean Hasbrouck House and the Dubois Fort and Visitor Center. A: The path of this year’s tour spans almost the entire length of the street – from the Abraham Hasbrouck House to the 1799 (LeFevre) House. This equates to about 0.35 miles of walking. A: Yes. 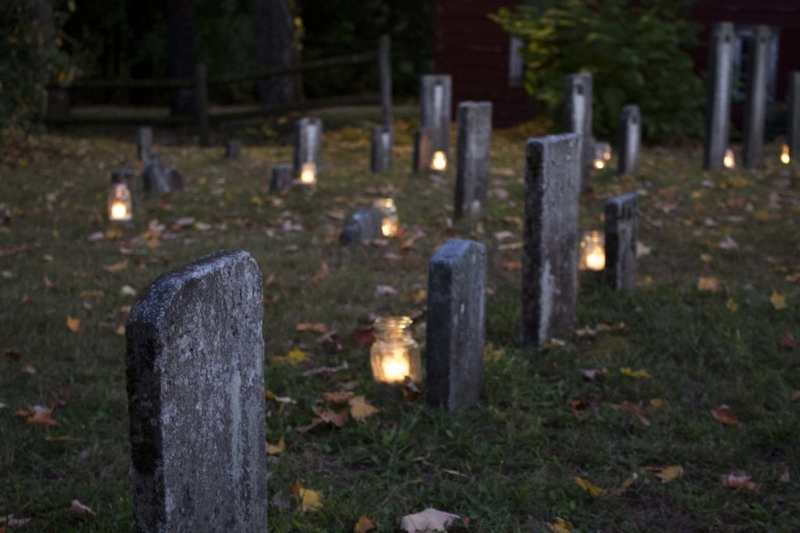 This year’s tour will bring visitors into the Abraham Hasbrouck House, the 1799 (LeFevre) House, and the 1717 reconstructed French Church, along with a walk through the community’s original burying ground. It is important to note that visitors will not be going into the wigwam, the Jean Hasbrouck House, or the Deyo House this year. A: Absolutely! Haunted Huguenot Street interpretations and themes change every year. The stories told on this year’s tour are completely different than the stories told last year, and the year before! A: Technically, yes. However, HHS highly recommends that you purchase your tickets online ahead of time. Tours sell out quickly. Due to the historic nature of the houses, HHS has very strict limits on how many visitors can be on each tour, which means that once a tour sells out, the museum does not have the ability to squeeze on an extra guest. A: This year’s tour is rated PG-13 due to some of the graphic/gory imagery that will be represented. Children under the age of 13 must be accompanied by an adult. A: The parking lot is located at 6 Broadhead Avenue, New Paltz, NY 12561. The Visitor Center, which is where you should check in for your tour, is just a short walk from the parking lot. A: Please wear comfortable walking shoes and dress warmly! Many of the buildings on the tour have little or no heat.